Hope everyone is doing well. We are currently still anchored in middle of Bamfield Inlet. 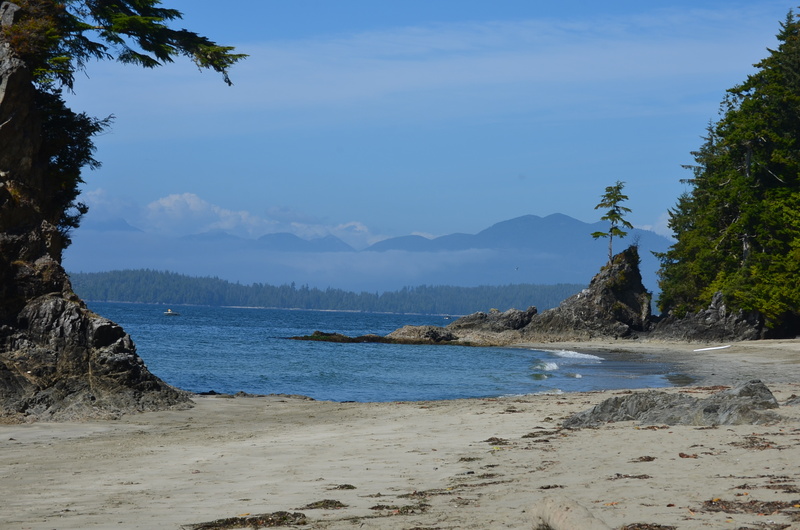 To keep our blog updated today we have some photos of the beach in West Bamfield. A gravel road will get there by foot for after a 20 min walk or if you are lucky you may be able to get a ride in a local’s car. The beach is sandy and mixed up with rocky outcrops. It is foggy someday but it looks wild and natural. We have found this place and it makes us feel happy. This is because of the location so close to the open Pacific Ocean, green forest, fresh sea breeze and how cozy we feel with people in this remote island community that make us feel like we are at home. We have adapted ourself to be living and enjoy this place as it will be our home to be shelter from winter storm until next spring 2015. Luksana is enjoying working in a Kitchen again and she is also enjoys being paid for it:-) Me I am still coming to terms that the “Big Plan” was a bust. But them’s the breaks. It does mean that she can go back to Thailand for sure and spend some time with her parents. Also my health is better. Was a scare realizing that a simple infection could have done me in. So now we need to find winter moorage so that we can stay warm and cozy:-) Now it is doable to ferry Luksana up the harbour in our little inflatable at 5.30 am every morning, but in winter storms it would not work. So it looks like we will have to find moorage on the East side of the inlet, so that she can make it to work. Little problems so we will see what happens.